I just love all things summer and that means taking advantage of the fresh garden produce that graces our presence during these months. We’ve been making a variety of vegetable dips these last few months and they hit the spot. When cooking for large groups, I often master healthier, low fat options by substituting low fat cheeses, sour cream, and always adding twice as many fresh vegetables (if the recipe calls for it), but it’s even better if it’s practically all veggies. Making dips is such a great way to learn to experiment with flavors, and all of our children have mastered culinary creativity in the dips they create. 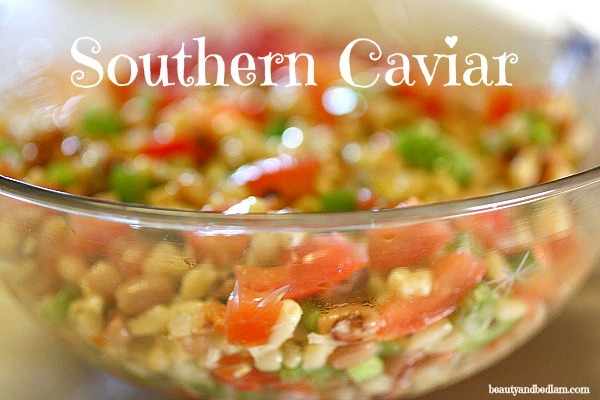 One of our favorites is this Southern Caviar recipe, which brings back such special memories. My mother- in- law has been gone for years now, but she served this the very first time I ever met her, and it’s made for all our family get-togethers. Finding out the history of a family recipe is always fun and our aunts shared so many stories about how that recipe traveled from Ga to MN to Wi and I brought it back to NC. Do you know the origin of favorite family recipes? If not, find out, and pass the recipe down through the generations. I have a whole post on creating a family recipe album with a template. Trust me, I am right there with you. I would NEVER have had the beans, but couldn’t believe how much I liked them. So easy though just to omit and add what ever you love. I make this, but we call it cowboy caviar. Got the recipe from one of hubby’s male co-workers. Definitely one of the family favorites! My other favorite memory about this recipe? Hiding a bowl of it in the back of the fridge so that the NC Schmidt family (namely my sweet brother and your amazing hubby) could actually have some before it was all gone… Since you guys always have the furthest to drive and are usually the last to arrive!! 🙂 This dip never lasts very long!!!! love and miss you all!! HAHAH!! In fact, I was just going to post this on facebook and tag all you guys. 🙂 This brings back SUCH amazing memories!! Miss you guys tons! This is basically what we call Cowboy Caviar or Texas Caviar! I LOVE this stuff!! Sometimes, I change the peas to drained/rinsed Black Beans. Really good wrapped in a warmed tortilla for a quick lunch!